In the first part we explored the theoretical part of the filter. Now, at this time we will actually try to find the suitable xtals for the bitx transceivers. Then try to measure the bandwidth, frequencies of the xtal so that we can put the BFO accordingly. As discussed on the part -1, measured the xtals series frequency with & without 33pf. All the data is given below. I used the PIC frequency meter. all readings are in Khz. the minimum reading is 10hz if you get more accurate reading it will be better to use it. All xtals are standard HC49. Now, what 3 or 4 xtals should i choose for 5mhz ladder filter. ? In the selection we have to see that the xtal frequency should not deviate from each other about 50hz. Interesting question actually i made a little write up and forgot to upload here. Well answere is simple but somewhat lengthy.... consisting three parts. First part::- consider filter as a gate. This gate has a centre frequency, actually a band of frequency between those frequency it allows to pass and for others there is steep rejection. These frequecies can be measured by feeding it a RF Signal from DDS_VFO and measuring the voltage at the output. At some freq it peaks then at some freq it drops down. now is the interestng part we have to find this steepness. at one point filter has 3db bandwidth these are two important frequency. It can be represented by the Voltage (y-axis) -----> Frequency(x-axis)... a flat dumpbell shape. 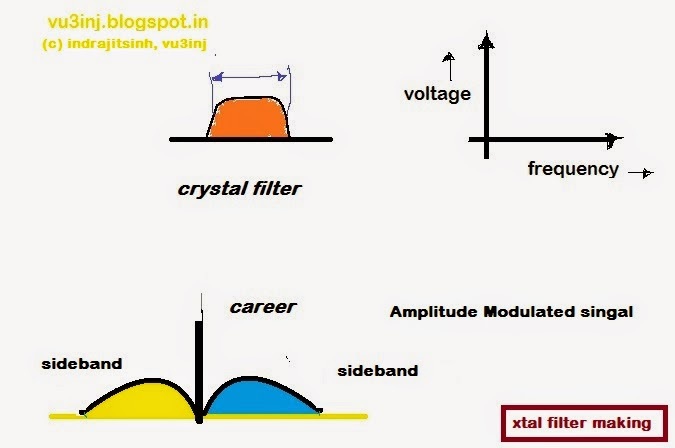 Every xtal-filter has different characteristics as it is not a commercially made filter for a fixed frequency. In our homemade ladder filter we accept whatever frequency band-pass our filter gives. so each fitler differes from other homemade filter.Bandwidh can be increased / decreased by ckt topology and components emperically. Second part:: - Amplitude Modulation is the basis for all the analogue modulations. In the Amplitude modulations there is carriers and two sideband containing acutal informations. (about 66% rf power is at useless carrer. In the DSB signal we suppressed teh carrier by balanced modulations. Now our signal contains only informations in two sideband. But by using the DSB singal we still waste our RF power in another sideband. As both sideband contains same informations. Is there any way to remove this another side band. Well we have to trim the sideband by some filtering. And here the role of the filter comes. In DSB modulations ,now our information is on the two side bands. USB is the signal where the information is on upper side band. in the LSB the information is In the lower side band. 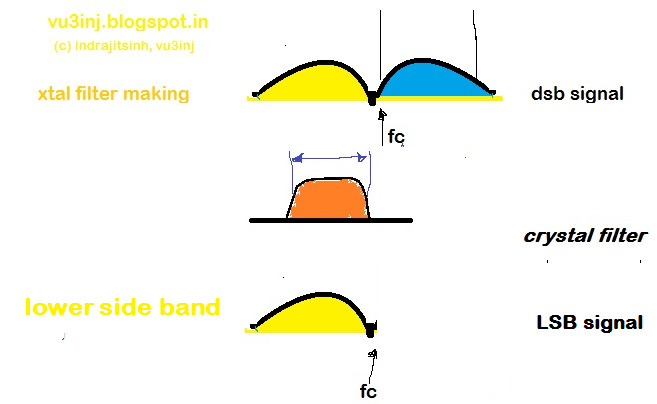 Another concept clerance this side band is related to the carriers frequency. where should the bfo need to be put..... Now, there is steep dumpbell like shape of the filter and the dsb signal is without the carrier unlike the AM signal. We have to play with it. Now, we have the steep ness of the filter. Our signal with two side bands. 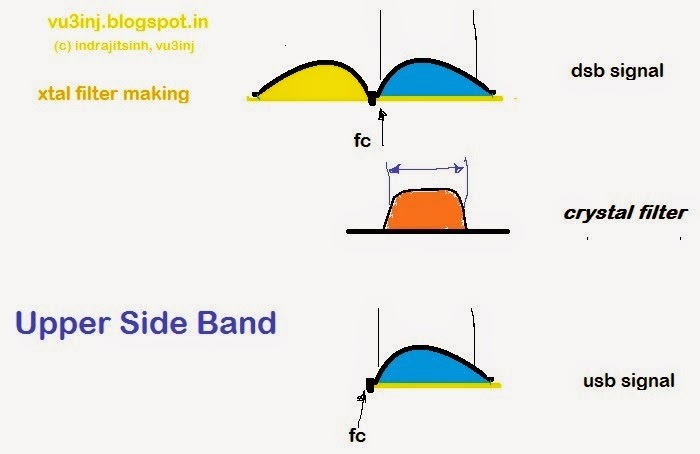 We have to fix the signals carrier frequency so that it collides with its steepness and let pass only the single side band of our choice out of two side bands. For USB the carrier should collide with lower side of carrier steepness that is its frrequency should be lower. To lower the oscilattor frequency use the choke and to increase the xtal osc freuq use the capacitor. Well using the LC in xtal oscillator will give you good tuning range, as we don't know where our filters freuqncy is exactly ? Xtal filters generally shift little down from their xtals marked frequency. To shift the freq down we need L in osc. hope you got it. some time i also get confused, so i draw it on the paper.... will upload it with full diagrams Actually these all are the practical things once you understand the theory afterwards it has be done practically. Query and answere ends here. It will be ALSO interesting to read the PY2OHH. he has published god work on farhans BITX. I HAVE FOLLOWED THE 2ESE in xtal making. As many people have successfully made xtal filter following him. Why re-invent the wheel ? Lets use it, as invented by the VU2ESE.